Gayatri Mantra was added to Rig Veda (10:16:3) by Sage Brahmarshi Viswamitra. There is a controversy in hinduism that women should not recite/chant ‘Gayatri Mantra‘. Neither do the Vedas nor sanatana dharma discriminated women. 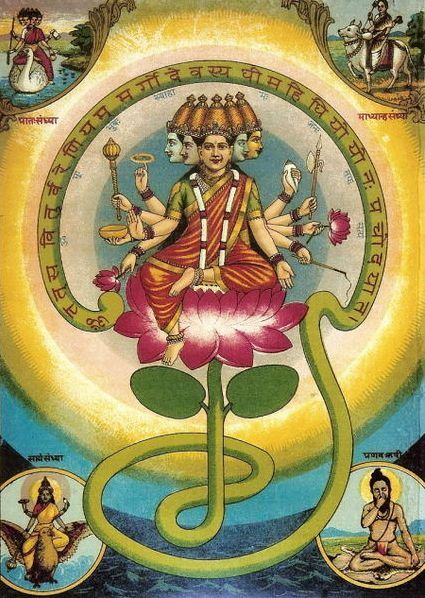 Infact womanhood is held in the Highest Esteem, and the universe, including the Trimurtis (Brahma, Vishnu, Siva) are said to be created by Goddess, who manifested herself into different forms. Then why is only Gayatri Mantra restricted from women ? In olden days, women had sacred white thread across their shoulder and participated in all vedic rituals. They even contributed towards many slokas in vedas. But in later years, due to their menstrual cycles and responsibilities of kids breaking their concentration constantly, they were kept away from vedic rituals. Slowly, the sacred thread and gayatri mantra went away from them. Even they are not allowed to recite Sundara Kanda of Ramanayana (for containing the gayatri mantra). It is well known that each vedic mantra has certain frequency and acts upon different parts of human body, glands, chakras and organs. Gayatri Mantra’s 24 digits produce vibrations that work on 3 invisible spiritual chakras (Mooladhara, Swadhishhtana, Manipura) in our body. Pituitary(near brain) and Prostate(near reproductive organ) glands in human body. These two glands release hormones that seperate male from female kids while they attain puberty. If a woman starts chanting these versus regularly, she is likely to lose her female-hood character and can get manly tendencies developed in physical appearance and behaviour. In most of cases, it can cause hormone disturbances in the body and disturb their menstrual cycle and even extend it beyond five days ! In rare cases, a woman who chants these versus frequently, develops masculine character which allows growth of facial hair ! These changes are not immediate and are noticed over a period of years. Lactating mothers who chanted gayatri mantra for 108 times per day, produced lesser milk than normal after 10 days. Even it effects vocal chord which differentiates voices of men and women. For someone who wants to pickup an argument by stating that women are suppressed, should understand that humans are divided as men and women by nature – not by humans. By birth, our gender is decided and our bodies are assigned few duties which cannot be altered. A man going through menstrual cycle or getting pregnant is considered abnormal, and so is a woman with facial hair. In an experiment on frogs, pre-recorded Gayatri Mantra was played at a pond where Frogs were moving around for mating. After about 10 minutes, few frogs went back into water, while others remained on land. When tested, all those frogs which remained on land were male and only female frogs left the place. Even animals are sensitive to frequencies and vibrations. Infact mantra sastra prescribes chanting of mantras related to female goddesses by men and male gods by women for quicker and effective results, because opposite poles attract !